The Oklahoma City Philharmonic is making Musical memories to last a lifetime! Presenting the E.L. and Thelma Gaylord Discovery Family Series Season opening concert, Sunday, November 5th, at the Civic Center Music Hall. Lobby activities begin at 1:00 p.m. and the concert begins at 2:00 p.m. Join conductor Matthew Troy for popular and classical music favorites inspired by our Mascot Phil the Penguin&apos;s animal friends. Tickets are $9 at the door. Season tickets for all three concerts are available for only $24.00 per person. Call (405) TICKETS (842-5387) or purchase at the CCMH box office the day of event. 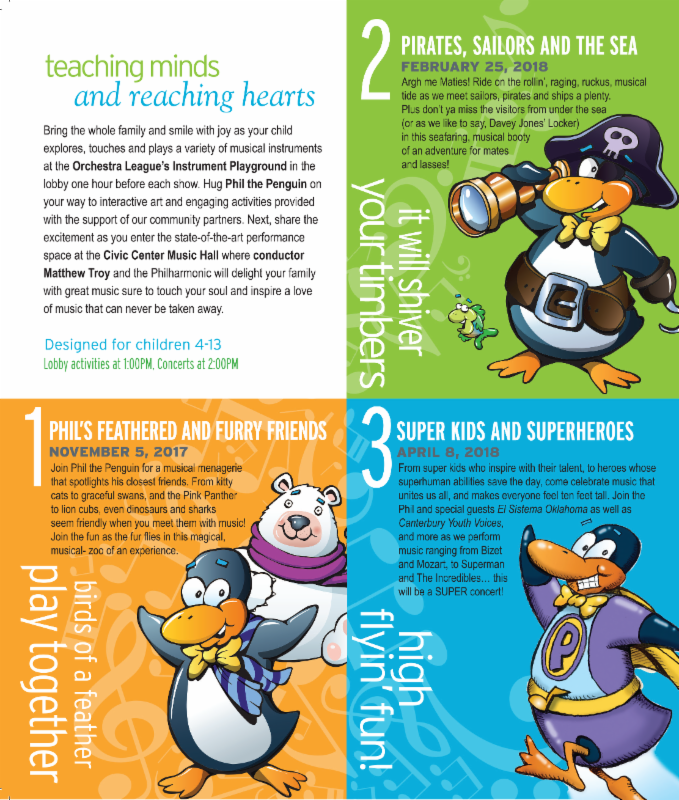 Says Susan Webb, Marketing Director of the OKC PHIL, "We are thrilled to bring this fun and enriching musical program to your family, with a price less than a movie ticket. Make memories to last a lifetime with great hands on activities prior to the concert in the Civic Center Music Hall lobby. Then enter the beautiful concert hall and experience live music, sure to make a lasting impression on your child." Lobby activity partners include Metro Family Magazine, OK Humane Society, The Metro Library System, The OKC Zoo, and the Orchestra League&apos;s Instrument Playground and more! Special thanks to concert sponsors: Ad Astra Foundation, and I Heart Radio. The Oklahoma City Philharmonic has gained recognition as one of the nation&apos;s premier regional orchestras. Tracing its roots to 1924, the Oklahoma City Philharmonic was formed in 1988 under the musical direction of Joel Levine and has remained steadfast in its mission "to provide inspiration and joy for the community through orchestral music." Through its consistent commitment to excellence, the Oklahoma City Philharmonic strives to enrich lives, expand cultural development, educate future generations, and provide audiences with a diverse and inspirational performance experience. Committed to expanding its reach well beyond the concert hall, the Oklahoma City Philharmonic enjoys a close collaborative relationship with Oklahoma&apos;s colleges and universities as well as the city&apos;s other premier arts organizations including Oklahoma City Ballet and Canterbury Choral Society. Additionally, the Phil presents the free, annual Red, White and Boom concert, which includes a spectacular fireworks display and is attended by thousands from across the metro each July. For more information or to purchase tickets, call 405-"TICKETS" (842-5387), or visit okcphilharmonic.org.